Medical Smartphones: Where is Windows Mobile Heading? Where is Windows Mobile Heading? I've been a Windows Mobile user for many years. In fact, I used devices that were once called Windows CE, then Pocket PC. I admit that I'm concerned about the future of Windows Mobile. We've seen the Apple iPhone really take off. The BlackBerry is stable within the corporate world. 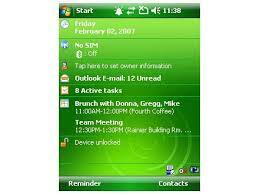 Android is gaining momentum and Palm has the WebOS in the new Pre. So what about Windows Mobile? We're all hearing rumors and still waiting to see some new and exciting developments from the people at Microsoft.Where is Windows Mobile ultimately heading? As it now evolves into "Windows Phone," will Microsoft ensure that manufacturers are releasing hardware that meet all the specs and requirements to run future versions of Windows Mobile? What's the area that needs the most improvement? Mobile web browsers. We've seen some great browsers come out, but the hardware on many phones don't provide the type of browing experience that you'll get on the Apple iPhone. I too have been a long time Windows Mobile user, one of the founding members of the Users group in Los Angeles the longest running group at MS.
Had the units before they were phones and were black and white. Windows Mobile has one item over the rest and that is security. There are still a few issues with Exchange and the iPhone as well, but those bugs will be worked out. Actually Microsoft has written software for the iPhone too before it was available on Windows Mobile. From the retail side of things Blackberry is just another OS, but for business it's another matter when you need a BB server and pay for 5 licenses to connect to Exchange per unit, versus one with Windows Mobile, which now can finally push email, something we all wanted forever, but gave Blackberry the corner on the market per se, but hey on the other side when you have each Blackberry user needing 5 licenses for exchange, if you were Microsoft you don't want to kill that cash cow too soon. I just posted a couple articles about Windows Mobile now doing ultra sounds too, so I don't think they are by any means going anywhere. There's definitely a big difference though with the consumer and business users with connecting to server apps like Communicator and what it can do and automate. There's also the new operating system coming soon as well. So I don't think we are dead by any means, as you saw Palm adapt the OS not too long ago too. It just all depends on what you want to do. I tried the Omnia touch screen, but prefer my Samsung i760 as I like a querty keyboard too, but that is an individual preference on my part and I can still load some classic applications from the old pocket pc days that you can't find anymore too.